Video walls are some of the most clean and effective ways to display information to visitors and employees alike. Lobbies, restaurants, sports bars, hotels, and many other outward-facing areas or training environments can benefit from applying visual learning or information. At BCI Integrated Solutions, we apply a vigorous process to determine the right size, scope, and functionality of video wall that works for you. With video wall experience in all markets from sports venues and education to housing and hospitality, BCI’s certified and trained staff can assist you in turning your video wall idea into a reality. We have offices in Tampa, Orlando, and Fort Myers, making installation, service, and monitoring in the Tampa Bay and surrounding area a cinch. But we’ve provided audio video solutions around the southeastern United States, and across the country. Contact us today for your personalized needs analysis. BCI uses top-of-the-line technology to provide you a video wall system tailored to what you need. Our technicians and engineers will learn the ins and outs of your space and design a video wall to accomodate those needs perfectly. We’ve installed video walls to meet a variety of client needs, including data tracking, optimize surveillance, employee training, or simply entertainment. We design our systems to captivate your audience, or provide function to your business. Whatever you may need, we’ll design the system and give you the control over it that you need to succeed for a long time to come. Our employees possesse the experience and certifications required to successfully install any video wall. 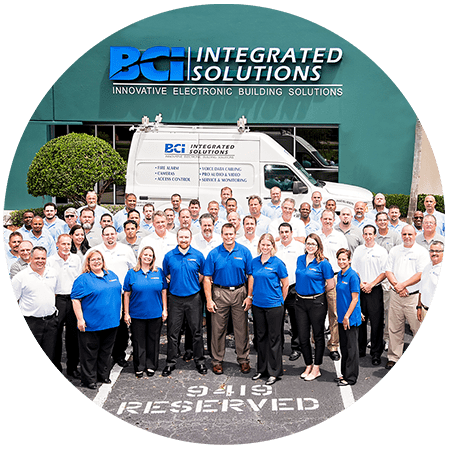 Several BCI representatives, technicians, and other employees are recognized as Certified Technology Specialists by InfoComm (now AVIXA) and possess specialties in Design or Installation. Our team will use their knowledge and experience to deliver you the video wall of your dreams.